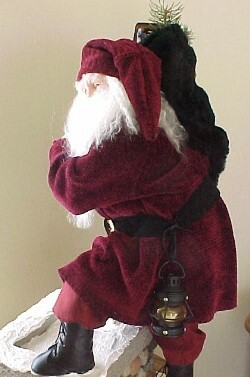 This One of a kind Santa stands about 28" tall. His hands and head are hand-sculpted using prosculpt polymer clay. His gray eyes are fade resistant glass. He has a long silky white mohair beard. 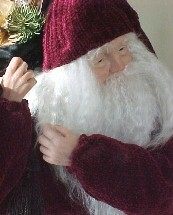 Santa wears a warm knitted style long coat and matching hat in a wine color, and black boots. Santa is leaning over with one boot on the handmade chimney top. His accessories include a vintage fur black bag with black tassel. Toys in his bag, include a small teddy bear, small boxed gift, mini toy gingerbread house, little rusty wagon and evergreen branches.